Unlike other mostly western countries, where black Friday is characterized by long lines of people braving cold days and nights outside major shopping malls, in Kenya, black Friday is simply a period of days. The experience is also mostly online where a handful of sites participate with almost zero walk-in stores taking part. Normal retail prices are hugely slashed and everyone’s online bliss lands on every ad banner that will redirect them to a mecca of sites whose items are within the pocket reach of the middle to low class earners. On 17th November 2016, GeoPoll conducted a Rapid survey on Black Friday using the GeoPoll mobile application. A sample of 103 men and 137 women filled the questionnaires on their spending habits during the Black Friday period which occurs in the month of November before the Thanksgiving US holiday. From the rapid survey, these were the insights. The data showed that the dynamic ads most marketers use to re-target their audiences may not work with regard to black Friday deals advertisements. Different target audiences change their shopping habits during this period from the normal wants to needs. Respondents were asked how they had prepared for the shopping experience and 44% said that they have saved towards it. What most marketers should still take notice of before counting their chickens, is 77% said that they were willing to spend between 10K -20K while 100K and above spenders accounted for only 2% which means most of the users are still not willing to spend on high end items although the prices will be quite reasonable. This is despite the fact that 36% of the respondents are looking to buy electroincs. The shopping spend of the respondents also highlighted that the 25% of the female demographic is looking to spend on electronics while a good 24% will also be spending on male fashion items. Naturally, marketers would decide to market household items to women who are assumed to be the main household shoppers but should not be the case as only 17% are looking forward to household shopping. 50% of men unsurprisingly, will be looking to get electronics with men’s fashion closely following with 32%. 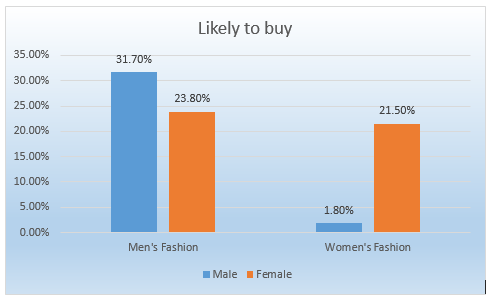 A twist of events came in when only a mere 2% said that they are willing to get women’s fashion which is a massive contrast to 24% of women who are looking to indulge in shopping for men’s fashion. Surprising enough is the fact that 9% of the male respondents mentioned that household items would be their priority. Notice how household items are a priority to men as compared to women’s fashion? Jumia is the king of online malls in Kenya with 72% of the respondents stating that that would be their ideal site. Killimall comes in with 23% bragging rights of the online stake while Rupu had 5% of the respondents backing it. Ultimately, the site that will wear the crown will still be the site that has the highest number of last click attribution to sale other than just consumer’s presumptuous shopping tendencies.